As nongovernmental organizations (NGOs) proliferate around the world, many in the nonprofit community are examining what model of organization best serves the populations they support—the traditional “brick and mortar” model, the fully digital form or a hybrid of both. What are the comparative advantages, strengths and weaknesses of “going digital?” Where do we see different forms of activism compete, and where are the most promising cases for collaboration? 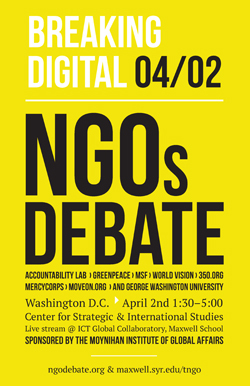 During an April 2 interactive debate in Washington, D.C., a group of academics and NGO leaders representing both traditional and digital NGOs will use a real-world crisis scenario as the catalyst for a debate about the advantages and challenges of adopting digitally enabled forms of activism and their relationship to theories of change, strategies and tactics, and organizational and leadership characteristics. The event will be held 1:30-5 p.m. at the Center for Strategic and International Studies, 1616 Rhode Island Ave., NW, Washington, D.C. The event is sponsored by the Transnational NGO (TNGO) Initiative at the Moynihan Institute of Global Affairs at the Maxwell School. Dave Karpf, professor, George Washington University (moderator). Tosca Bruno-van Vijfeijken, director of the TNGO Initiative, says that digital NGOs and brick and mortar NGOs are not binary choices; they operate on a spectrum, a continuum in civil society. But each has legitimate reasons to claim that its approach is best. A live stream will be broadcast to 060 Eggers Hall, the ICT Global Collaboratory at the Maxwell School, and will also be available at http://www.ustream.tv/channel/maxwellsu. This event is made possible by a Moynihan Faculty Challenge Grant and is part of the Maxwell School’s 90th anniversary celebration. For more information, go to http://www.ngodebate.org or https://www.maxwell.syr.edu/moynihan/tngo/Digital_NGO_Debate/, or contact Ken Harper at the Newhouse School, 315-443-6131 or Tosca Bruno-van Vijfeijken at Maxwell, 315-443-5073.